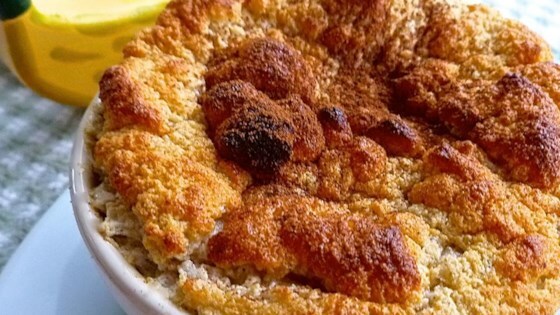 "A light, fluffy banana souffle." Preheat oven to 400 degrees F (200 degrees C). Brush 4 1-cup souffle dishes with melted butter; sprinkle the insides of the cups with sugar. Set the egg yolks aside, and place the 4 egg whites into the work bowl of an electric mixer. Beat the egg whites and salt until the whites form soft peaks. Place the 2 egg yolks, bananas, honey, vanilla extract, and ginger into a blender; pulse until smooth. Scoop the banana mixture into a bowl; use a rubber spatula or wire whisk to gently fold 1/4 of the beaten egg whites into the banana mixture. Gently run the spatula through the center of the bowl, then around the sides of the bowl, repeating until fully incorporated. Fold in the remaining egg whites, being careful to keep as much air in the mixture as possible. Spoon the souffle mixture into the prepared dishes; bake in the preheated oven until the souffles have puffed up above the baking dishes and the tops are browned, about 15 minutes. Sift a little sweetened cocoa powder over each souffle for garnish to serve. One thing I discovered while making this: the recipe fits great in either 4 1 cup small ramekins/soufflé dishes.... or between two standard ceramic coffee cups for something more casual. Nothing special. Looked great. Not sure what I expected but it was not this mushy egg dish. Probably will not make it again. Very, very light, not to mention easy. It would actually make a fun breakfast. I'd add more ginger b/c I couldn't taste it in my souffle. Thank you for submitting this recipe! My very first attempt and it was a total success, and so easy! We will deffinately be eating this often! So easy to make, I couldn't believe it. It was wonderful, and the house had such a nice aroma!